San Francisco. 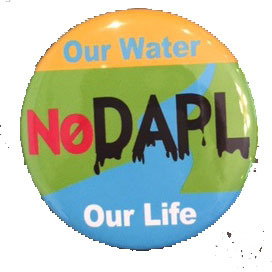 On Thursday, September 7, 2016, a press conference in solidarity with the Standing Rock and Cheyenne River Sioux Nations will be held at the Army Corp of Engineers San Francisco office. The group will meet at 1455 Market Street, from 10am-11am. The Standing Rock Sioux Nation is suing the US Army Corp of Engineers in the US District Court in Washington, D.C., demanding that the pipeline permit be rescinded, that the engineers withdraw their nationwide permitting process as it applies to the pipeline, and for the environmental impacts to be properly reviewed. The court will hear the case on Friday, September 8, 2016. Background information: In 2014 Energy Transfer Partners and Dakota Access planned a 1,168 mile long oil pipeline that will carry crude oil from Bakken oil fields of North Dakota to Illinois (via South Dakota and Iowa) where it will link with another pipeline to terminals along the Gulf of Mexico. The US Army Corps of Engineers along with these oil companies is attempting to “fast track” this project without proper legal consultation with tribes, inadequate archaeological and anthropological studies nor proper environmental review. Canadian pipeline giant Enbridge announced it will also invest in this pipeline as well. Dakota Access plans to run pipelines under the Missouri River in three places. Those areas directly threaten the drinking water for the Standing Rock Sioux and the Cheyenne River Sioux nations, as well as the 18 million people who depend on the Missouri River for water, such as ranchers, farmers and city dwellers. This press conference has been organized by NoDAPL Solidarity SF. We are a local Environmental Justice and Climate Justice activist group responding to a call from our sisters and brothers at the Sacred Stone Spirit Camp and Sioux Nations. Our organizing committee includes Indian People Organizing for Change, Idle No More SF Bay, the Chinese Progressive Association, PODER, and Indigenous Women of the Americas Defending Mother Earth. For more information, contact Teresa Almaguer at 415-431-4210 or tere@podersf.org.